Seattle Opera Blog: May 2, 2012: GiveBIG to Seattle Opera! 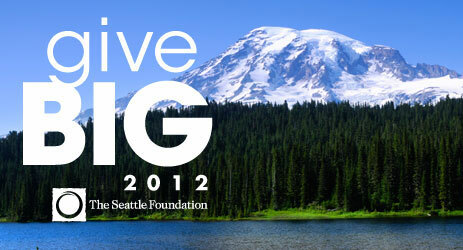 May 2, 2012: GiveBIG to Seattle Opera! 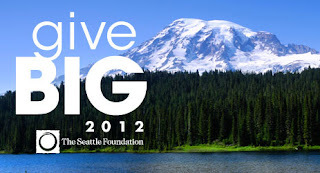 Next Wednesday, May 2, Seattle Opera will participate in GiveBIG 2012. GiveBIG is a 24-hour community-wide challenge to give generously to non-profit organizations through The Seattle Foundation website. Last year, the first GiveBIG on June 23 raised more than $3.5 million in a single day through 18,800 donations from individuals. On May 2 you can double your gift! Every dollar of new or increased gifts that you donate through GiveBIG to Seattle Opera will be matched by the Brian Marks and Carol Maione Challenge Grant Fund (up to $50,000). Donations must be made through the Seattle Foundation website between 12:00 a.m. (midnight) and 11:59 p.m. on May 2, 2012, to count toward GiveBIG. Win a Golden Ticket: Every hour there will be a drawing for a $100 Starbucks gift certificate (for you) and a bonus $1,000 to Seattle Opera (attributed to you). What will my gift do for Seattle Opera? $50 (doubled to $100 by the Brian Marks and Carol Maione Challenge Grant) provides music and story time programming for early learners at a local library branch. $100 (doubled to $200) allows one child to attend Opera Camp through a scholarship. $200 (doubled to $400) covers the entire cost for two costumes on the Young Artists Program tour through the Pacific Northwest. $300 (doubled to $600) provides 75 Experience Opera students the opportunity to see a working rehearsal or a final dress rehearsal. What will I receive for my gift to Seattle Opera? Knowledge and satisfaction that you personally helped Seattle Opera’s mission to create musically extraordinary, theatrically compelling opera in the Pacific Northwest. Help Seattle Opera stand out on the biggest day of the year in Seattle philanthropy. Wow opera! I missed it.But thanks for the information. You have such awesome post, I have read more about it, But seriously that different learning for me. Thanks for share.